This is a sad day for us all. 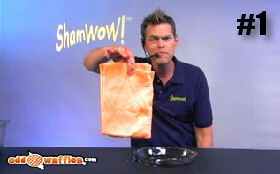 Apparently, the ShamWow Guy is a devious character who purportedly beat up a prostitute after she bit his tongue. More on the story here, here, and here. I don’t know whether to feel betrayed that my illusions of the ShamWow Guy are gone (I mean, if you can’t believe in the ShamWow Guy, who else might be tainted? That Mr. Clean character has always seemed dodgy. And how can I ever trust those Charmin Bears again?) or to be amazed that so many people have posted about this. When did ours become a culture so concerned about the scandals of infomercial hosts? Although, I have to admit that I’ve kind of always wanted a ShamWow. And I feel a little let down that the ShamWow Guy is not an upright citizen. Now I suspect his claims about the absorbency of the ShamWow are not to be trusted.